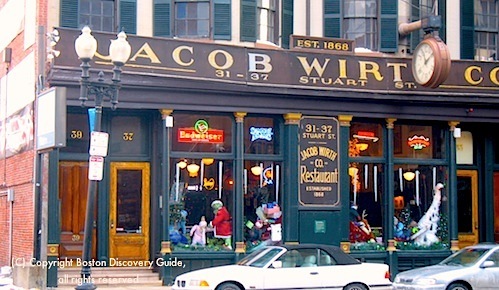 Jacob Wirth has been serving great food and great beer since 1868, one of many German restaurants started by immigrants to Boston. Now, it may be the only remaining Boston restaurant where German specialties like Wiener Schnitzel and Sauerbraten star among the entrees. Located in the Boston Theatre District and close to the Tufts/New England Medical Center, Jacob Wirth attracts an eclectic mix of theater goers dining before and after the shows, groups of hungry med students, neighborhood residents, business people who stop by after work for a beer and a burger, and even actors, sometimes still in make-up. It's also an easy place to come when you want to hang out with family or friends. In addition to the German dishes, you'll find plenty of American favorites like mac and cheese, fish and chips, burgers, sweet potato fries, and sandwiches. 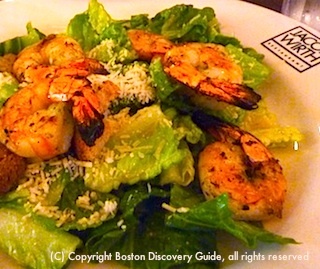 For lunch, I love their Caesar salad with grilled shrimp - that's what you see in this photo. For dinner, I usually order the fish offering on their "daily specials" list. Even though they do not specialize in seafood, they always cook it perfectly, usually with interesting contemporary flavors and accompaniments. Jake's Bar provides a popular gathering spot for neighborhood regulars and theaters goers every night. On Friday nights, a live piano player, songbooks with 500+ songs from the 50s, 60s, and 70s, and loud group sing-alongs attract packed crowds. Jake's spotlights German and Belgium beers - but other European countries plus American beers, including local Massachusetts brews, are also well-represented. 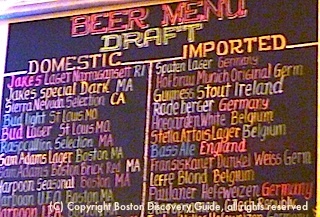 In particular, Jake's serves the best German and Belgium beer in Boston. What's really cool about this restaurant is its authenticity. 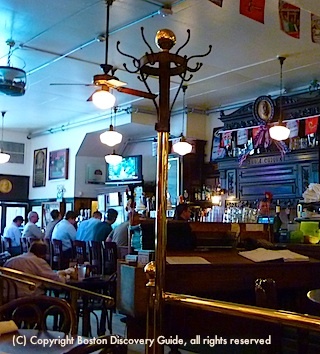 As you check out the high ceilings, dark bentwood and brass interior, wooden floors, and the medallion with the picture of Jacob Wirth Sr and his enormous handlebar mustache right over the mahogany bar, you're seeing basically what customers 150+ years ago saw. 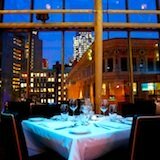 Some restaurants try to imitate this style so that they seem old and quaint; here in this popular Theatre District restaurant, it's the real thing. Generations of locals have loved - and continue to love - this place, with its hearty and affordable food and drink, warm and welcoming ambiance, and comfortable decor. 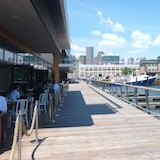 If, as a Boston visitor, you stop by for a bite and a beer, you will too. Because of its Theatre District location, Jacob Wirth's staff is accustomed to getting customers in and out in time for the opening of whatever show they're attending. Let them know your time constraints when you make reservations, and they'll make sure you have plenty of time to get to the theater. Keep in mind that the food here is cooked to order, so some dishes take awhile to arrive in front of you. But the food is well worth waiting for . 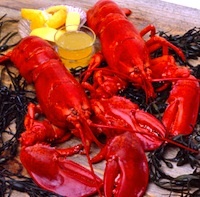 . . plus a beer and an appetizer will make the time pass faster!